The all-new K2000 was developed to offer best-in-class cleaning performance and unparalleled ease of use. This electric pressure washer delivers 2000 PSI of TruPressure, ensuring you get the highest level of cleaning power, and is driven by a rugged induction motor. It includes convenient features such as an unique on/off foot switch, a pressurized hose reel, a handy storage bin, two removable half-gallon detergent tanks and four spray nozzles (including a turbo nozzle for intense cleaning). Metal hose connections, oversized no-flat wheels and an integrated aluminum frame make this unit highly durable. Universal quick-connect nozzles and standard M22 hose connections simplify nozzle and accessory usage. Best of all, no tools are needed for assembly – you can set up and start using the K2000 in five minutes or less! When you're done cleaning, simply fold down the handle for compact storage. 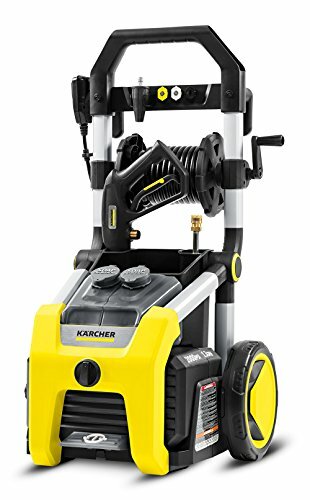 Backed by a three year limited warranty, the K2000 is Kärcher's top-of-the-range consumer electric pressure washer and the ideal outdoor cleaning companion for demanding homeowners. If you have any questions about this product by Karcher, contact us by completing and submitting the form below. If you are looking for a specif part number, please include it with your message.